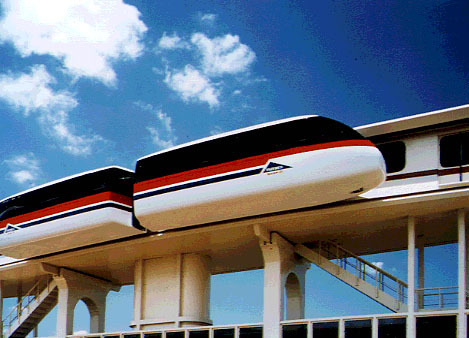 Project 21 stands for two-way traffic on a single “monobeam.” It is an aerial transit system often characterized as an “off-the-street steetcar” or a scaled-down Metro system. 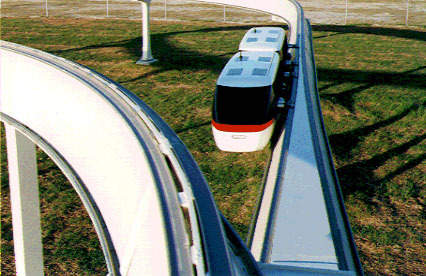 In terms of views blocked or shadows cast, it is clearly smaller than any other urban rail or any full-size, two-way monorail. And, it has a breakthrough switch that for the first time permits networks of elevated lines to serve throughout a city. The key feature of the system is a triangular steel beam less than six feet wide with two tracks, one on each side. Trains with one to four cars no larger than a typical bus roll alongside. Slender columns, also of welded steel, round out the compact geometry. Enclosed stations, easily based within the median of a boulevard, receive trains alongside and are roughly 1/4 as long as a Metro station. Larry Edwards, aerospace executive, invented the system at Lockheed and pursued it independently from 1972 to 1976. He refined it in spare time while working at NASA Headquarters, and resumed full-time effort in 1987, when he received a Department of Energy grant to validate System 21’s energy–saving potential. He subcontracted some tasks to William Mouton, Professor of Architecture at Tulane University of New Orleans, who grew so enthusiastic that he and his students built a large-scale model, shown at a nearby National conference of transit professionals. Edwards founded Futrex Inc in 1990, and the company moved to Charleston, SC, when a major Navy Yard was closing and it was agreed that Project 21’s infrastructure might be built in those facilities. 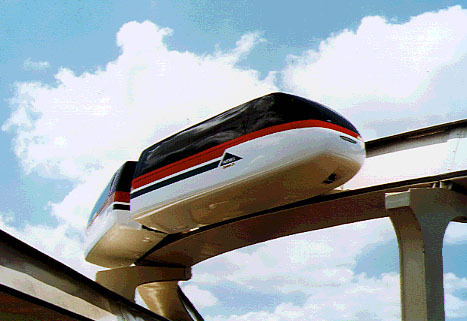 In 1995, the Department of Commerce granted funds to Charleston, which lent $1.25 million to Futrex toward construction of a functional scale model. That model, which demonstrated the car suspension, the switch, and the station interface, was unveiled in 1996 to national and international acclaim. By then other executives were in place and Edwards turned over the accumulated designs, tradenames, and other assets to Futrex. The two parties agree on this: the Project 21 monobeam is the lowest-cost candidate for metro-like rail transit; it can be installed faster than any full-scale competitor; and it is a world class choice for aerial transit network applications. Additional illustrations of the Project 21 concept are available as is an article, entitled The Future: A New Urban Transit System Stands a Chance of Getting People Out of their Cars. It was published in the Architectural Record.